Wait, is that three planes in one? Richard Branson, billionaire founder of Virgin and lover of all expensive flying things, celebrated the first successful test flight of his crazy spaceship for tourists – the VSS Enterprise. Branson hopes to welcome the first commercial operations flight in 2012, with yesterday’s 45,000 three hour trip over the Mojave Desert a success set to keep him on schedule. 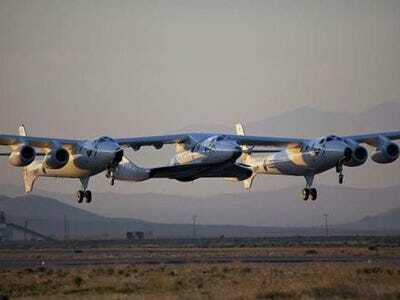 “When Virgin Galactic is ready to really take off, the craft will climb to about 60 miles above the Earth’s surface. At that suborbital altitude, passengers will experience weightlessness and see the curvature of the Earth. The price for the experience: $200,000,” according to the Los Angeles Times. Though they won’t be taking off for a while, 300 people are already registered and 80,000 are on the waiting list to get to space, according to CNN.